Become One Circle, a photo by timtak on Flickr. The Japanese phrase "become one circe," (一丸となる) refers to a group cooperating to the utmost degree, as if as one organism. The North Saga High School (佐賀北高校) Baseball team did just that, and went on to achieve a breath-taking win in the 2007 summer Koshien Baseball tournament over much bigger, expensively coached opposition . The "Saga-Kita" team had a ritual that they performed before and some times after, "play ball" where they would get into a huddle on the mound and point at the sky. The meaning of this was to them that they would become as one circle, as one mind. They were so good they bring tears to my eyes. Arimasa Mori says that the "experience" (keiken) of the Japanese always presupposes another. I am not sure I agree but, if this experience is the same as that referred to by Kitaro Nishida ([junsui]taiken) then I can see how "becoming one circle" may be more than just a metaphorical possibility. As Nishida argues, "pure experience" is "completely contradictory" since the primal place, or circle, is both oneself and the world, and therefore also ones team-mate. Saga-Kita are playing again in this year's Koshien Tournament, once again as a result of becoming "one circle（一丸)." Empire of the Circles, a photo by timtak on Flickr. In response to a student question about why it is that a tick (or check ✓) mark often means bad in Japan, where as the the Japanese symbol for right or correct is the circle I listed some of the many ways in which Japanese use circles to represent, the good, the true, self and I believe mind, which is the origin of the utilisation of this sign. The mirror of the Sun-Goddess, which she carries, represents her, is her or her mind, is eaten to ingest her, contains (in the form or Enma's mirror) ones whole life, represents Japan as its flag, its families in their crests, themselves in their seals, is used in numerous postive expressions for completeness and the absense of imperfection, is found emphasised in the faces of infants characters, and is the meaning of the word "yen." To express good Americans use a circlular sign in the form of an okay sign. The Japanese use this sign as well as that made by making a circle using their arms surrounding their head. They also sit in circles, give people circular cards for their signature and all the other things in the image above which I will explain with reference to Nishida's place, or mental mirror (Heisig) which Westerners may understand as the visual field (bottom right) but in fact it remains, as ones heart, even when ones eyes are closed. Empire of the Sounds (continued from last post), a photo by timtak on Flickr. I will probably update my previous blog entry retitled as "Empire of the Sounds" since there is a lot to suggest that sounds mean more in Japan. In addition to the last post one might also mention the gangs of motorcyclists (Bousouzoku) that define themselves by their ability to make sounds, the prevalence of beefy exhaust pipes even on low power cars suggesting that the ability to make a noise means almost as much as being able to have the ability that comes with it. Then there is Tsunoda's research which argues that Japanese hear music and insects with the same part of their brain with which they process language, which he claims suggests that the Japanese hear more meaning in these sounds. Then there are the sirens that mark meal times, the song (a Japanese version of Auld Lang Syne) that marks the end of the business day, the prevalence of shop theme-tunes such as "Oh Happy Friend, Let's go Shopping...Mr. Max, Mr. Max, Mr. Max" which drive me insane, the tune playing pelican crossings, the Throat Pride (nodo jima) programme, and Fried Potatoe vending trucks. However, if sounds were really meaningful, if sounds were felt to be imbued with self, then Japanese people would not be able to walk past these endless loop tape recorders that I still find rather arresting. "Someone is speaking to me"" I think, and stop. The Japanese Feel Voices: Nacalian Meltown and Oral-Centrism, a photo by timtak on Flickr. Continuing with some phenomena that do not conform to the Nacalian, Japan as ocular-centric culture theory proposed on this blog, Tanaka's recent research on incongruent expressions of emotion in voice and facial expression is even more damning. Tanaka and colleagues (Tanaka et al., 2010) first videoed a Japanese (as shown above) and Dutch woman say a linguistically neutral phrase ("is that so", "sou nan desuka") in a happy and angry voice. They then created voice-face incongruent stimuli by swapping the sound track between the two videos. 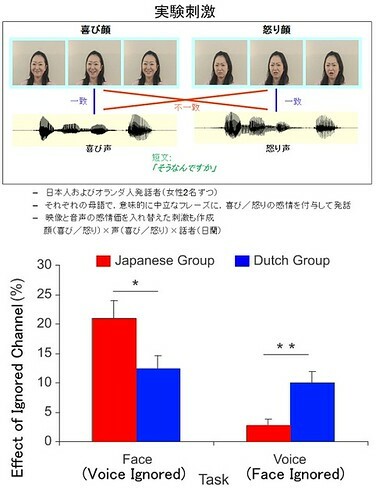 Dutch and Japanese subjects were then asked to judge the emotion of the face (and ignore the voice) in the face task (left hand side of the graph) and to judge the emotion of the voice (ignoring the face) in the right hand side of the graph. The time to judge the emotion in the voice-face congruent video was substracted from the time to judge the emotion in the incongruent video, giving the extent to which the back-channel, to-be-ignored information (voice, or face) slowed the subjects responses. The above graphs show the size of the error that the ignored channel resulted in. As can be seen, both groups found the voice more difficult to ignore but, the Japanese found it far more difficult to ignore voice than face. And the Dutch were significantly worse at ignoring faces and very significantly better at ignoring voices than Japanese. Upon a straightforward Nacalian interpretation (that Westerners are logo-phono-centric, while Japanese are visio-centric), these results should have been reversed. These results would seem to agree with those of my previous post regarding the McGurk effect, which shows that Japanese are less effected by facial information, and more attentive to voice, when interpretting phonemes. Taken together with Ishii's research, which showed that Japanese pay more attention to voice than words, one might conclude that Japanese cultural communication is centered upon tone of voice: an oral culture. I can think of other anecdotal evidence to support this view. 1) The Japanese are fond of stage plays featuring their (super) heroes, such as bean-bread-man (Anpanman), Power Rangers (supa-sentai), Ultraman, and Masked Riders (Kamen Raida-). When these plays are performed the stage actors dress up in the appropriate costumes and masks, and then mime to a audio recording of the authentic voice actors voices. I do not know of a similar genre of drama in the West, but if there were to be a play of Batman, Superman, Spiderman, or The Incredible Hulk, I presume that the viewers would be satisfied with seeing costumed actors play these heroes parts and would not mind if these actors used microphones to voice their own words rather than demanding that they mimed to the voices of the actors that play these parts in recent movies featuring the same heroes. The Japanese demand for vocal miming on the part of the stage players, suggest again that if the voice is different then the self or persona of the hero is different. At the same time it is notable that even the "authentic" heroes of Japanese TV programs, partly as a result of their faces or masks having NO MOUTH, are miming to voice actors themselves. 2) I feel that more traditional, or more-Japanesey- Japanese speech presentations, by older Japanese, who while remaining fairly straight faced use their tone of voice more than I was used to in the UK. 3) Similarly non-Japanese that have been acculturated to Japanese culture, use more vocal intonation than I am used to in my Western upbringing. I get this feeling when I watch David Spectre and the two Kents (Kent Derricot, and Kent Gilbert) all of whom, especially since they appear Western having Western faces, sound strange to me, or appropriately Japanese to me in that they vary their vocal intonation greatly. 4) When watching Western movies dubbed into Japanese the extent to which the Japanese voice actors vary their intonation far more (it seems to me) than the Western actor is striking. I had interpretted this (to my ears) excessive vocal intonation on the part of dubbing voice actors to Japanese perceptions of Westerners being more unihibited, and this may be part of the reason for this phenomena, but perhaps also the dubbing voice actors are simply giving the Western actors a more typically Japanese vocal-expressive range. 5) Again when watching Western movies dubbed into Japanese, the males are given deeper voices (especially if they are strong) and the women are given more 'feminine' higher voices exentuating their gender differences in voice. 6) Japanese men and women at least in the media, especially evident in period dramas (jidai geki) and Yakuza movies, and perhaps in real life tend to speak in more gender differentiated -- deeper for men, higher for women -- voices. I am not sure if Western men have a tendency to gender-neutralise their voices, or if Japanes men have a tendency to speak in deliberately more macho tones, or bothy. Certainly young (but not necessarily older) Japanese women have a tendency to speak in higher voices in order to be attractive, at least so it seems to me. 7) Japanese female shop assistants (I am not sure about the men) raise their tone an octave in an attempt to make their voice more polite and appealing. I find this affectation somewhat too self-debasing. I find myself wanting to say "No, please do not go so far as to alter your voice. I don't want you to be so ingratiating. Be your own voice. I am not so grumpy and authoritarian a customer as to require this degree of self-debasement." 8) The Japanese are more fond of singing, in the form of Karaoke, as a post alcohol consumption, probably courting, pleasure activity and this of course results in their using their voice as a means of self expression (whereas Westerners are more likely to dance in similar situations for similar reasons). 9) The Japanese use 'stomach drama' (hara-gei) to convince others of their point of view or their sincerity. This is something I have read. I am not sure if or when I have witnessed 'stomach drama', but the use of extreme vocal intonation in this form is well documented. 10) Japanese emotive expressions, such as those expressing cuteness (kawaii--) or delisciousness (oishii---) often sound to my ears as being over-the-top in their use of vocal tone. Whatever the fate of my Nacalian theory, the research by Tanaka, Sekiyama, and Ishii, point to cultural differences in sense (oral/visual) or channel (oral/visual/linguistic). As such I find them very exciting: a break from the individualism vs collectivism mold. This genre of reseach raises the possibility that Japanese have a different type of communication, and a different type of non-logocentric, individual self. Tanaka, A., Koizumi, A., Imai, H., Hiramatsu, S., Hiramoto, E., & De Gelder, B. (2010). I Feel Your Voice. Psychological science, 21(9), 1259. The McGurk Effect Weaker in Japan: Nacalianism Defeated? The McGurk Effect (McGurk & MacDonald, 1976) refers to the tendency for visual-speech (lip movements etc) to effect the sounds that we hear. As shown in the above video, Japanese people area also susceptible to the effect but, as comparative research (Sekiyama & Tohkura, 1993; Sekiyama, 1997) has shown, Japanese and Chinese are more auditory and less visual than Americans! The Nacalian theory - that Japanese are visio-occular-centric as opposed to logo-phono-centric - is thus disproved, game, set, match? Very possibly. 4) The Japanese move their faces less during speaking for cultural reasons. 5) The Japanese watch faces less, or in other words they are less "face-aversive" (Sekiyama, 1997) for cultural reasons. I lean towards the latter two explanations - both of which seem true - but neither bode well for Nacalian interpretations of Japanese culture. Why do the Japanese move their faces less, and look at others faces less if they are really a visually sensitive culture? 1) That the Japanese are paying attention to a different part of the face - eyes - rather than mouths, as demonstrated by Yuki's research (Yuki, Maddux, & Masuda, 2007). 2) Relatedly, that the Japanese do communicate with their face but not linguistically, and that their face is reserved for displaying purely visual, not language-supplemental, information. Consider for instance the close ups of people eating food shown so often on Japanese TV, or the insets of Japanese television personalities faces showing reacting non-verbally to the image on the screen. 3) That the Japanese identify more strongly with their faces and wish to maintain an unchanging persona or mask (Watsuji, 1937) for the sake of visual self-consistency. I claim that the Japanese are into visual self-consistency, and even a visual self-enhancement of sorts, in a big way. Shigeno, S. (1998). Cultural similarities and differences in the recognition of audio-visual speech stimuli. Fifth International Conference on Spoken Language Processing. Yuki, M., Maddux, W., & Masuda, T. (2007). Are the windows to the soul the same in the East and West? Cultural differences in using the eyes and mouth as cues to recognize emotions in Japan and the United States. Journal of Experimental Social Psychology. Japanese Entrance Hall (Genkan) with Sofa, a photo by timtak on Flickr. A genkan is a entrance hall, at a slightly lower level to the rest of the house which is raised, where people take off their shoes before entering the home. It is also used as a place to display ornaments and sometimes as a place to briefly entertain casual visitors. It is not uncommon for householders to kneel in the corridor just beyond their genkan, while their visitor stands on the lower genkan floor. 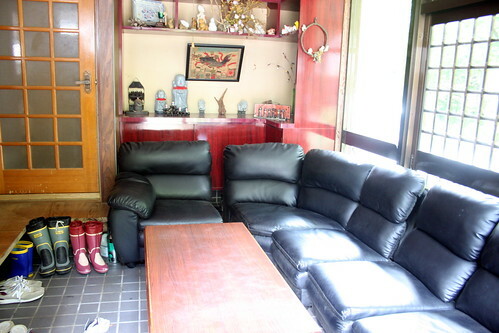 To make casual visitors feel more comfortable, this (very unusual) home in a Buddhist temple's grounds has a three piece suite in the genkan, so that the monk can entertain without allowing visitors into the home. The home is considered more private in Japan and entrance to other people's homes is more often avoided. House parties are a rarity and generally limited to extended family members. Entrance to another persons home, and the further one enters into that space, implies a greater degree of social intimacy. Nakane (1972) argues that Japanese groups, including the family, are considered to be bound together not by virtue of shared concepts such as common goals, or mutual love -- though of course they usually love each other -- but by their membership to, and ability to enter a shared frame, or place, such as the home. Family members refer to each other as "our place's bride' (uchi no yomesan) 'our place's granny," (uchi no obaasan), or "our place's leader" (uchi no danna) meaning husband or patriarch. Marriage ceremonies are said to take place between homes or houses in a way reminiscent of marriages between European aristocracy*. Entering a Japanese person's home, to its depths at least, implies that one is a member of the family (see Bachnik and Quinn, 1994). These customs are indicative of the way in which the home is considered to be a special, semi-sacred space centred around the household altars (kamidana and bustudan), and as such an important vector of social cohesion. Bachnik, J. M., & Quinn, C. J. (Eds.). (1994). Situated Meaning: Inside and Outside in Japanese Self, Society, and Language. Princeton University Press. Nakane, C. (1972). Japanese Society (1st pb ed.). University of California Press. Japanese Space Unextended & Western Time That Does not Flow, a photo by timtak on Flickr. I recently argued that Japanese gardens, top left, and interiors, middle left through the use of trickery encourage Japanese to see space as the primal space (Nishida, Watsuji) that is devoid of scale and conceptually unextended, as the pure experience where the world and the heart meet. Additionally bottom left, it is well known that Japanese love to go and see the passing of time, autumn leaves, and spring cherry blossom, or fields were once great castles stood. This may very Buddhist, and profound of the Japanese but it is worth bearing in mind that not only do they pay attention to the "A series" of becoming, but also to "B series" objective points in time related to the seasons, and specific dates. Time is out there. Westerners, on the other hand, like to emphasise the extensiveness and exteriority of space with geometrical patterns in gardens, white celings and bay windows in their rooms. Space is seen as extended, complete with the concepts, the symmetry and geometry, that keep it so. Westerners like spatiousness, big rooms, big views, big spaces. But they are conflicted because at the same time they want to preserve the past in their rooms and in their cityscapes. Westerners like to present time as if it were stationary, as if the past is is in the here in now. Space is the medium of the self as image and mental mirror (Heisig, Nishida). Time is the substrate of the self-narrative and language as thought (Derrida, Kim). The above is not right. And it is a make or break post. Conventional wisdom has it that the Japanese are (Buddhist) relativists, and that Westerners are the objectivists that believe in the world and the world and themselves, due perhaps (though scientists would not agree) to their belief in a third person, an Other. And I too thought/think that the Japanese fondness for scale trickery and their fondness for the changes in nature were both indications of a tendency towards anti-objectivity, and relativism. But if that is the case, then my argument that the Japanese are like Westerners but in a different modality or channel, that they have a different kind of Other, a different kind of objectivity, would have to be rejected. Because space is surely the plane, substrate, or place of the visual (self) and time is argued (by Derrida especially) to be the modality, medium, or (dare I say place? topos, axis?) of the phonetic narrative (self). Place is where vision takes place, time is where phonemes unfold. If so then attitudes towards space and place should exhibit a similar "Nacalian" reversals (if such exists) as between word and image. Attitudes to space and time would or should be related through a meta-Nacalian reversal. I am having a problem seeing any such reversal. It still looks to me rather like Westerners are being objective, and Japanese are being relative, about both space and time but I hope not. I was wrong to say that Japanese are into the B series of time. First of all, they use period names for dates rather than relating everything to a year dot. The period names encourage, I believe, a before after view of time rather than some objective temporo-cartesian coordinate (X years AD). So okay, Westerners are into the year dot, the B series of time, whereas (other than Mecca and Jerusalem) there is little in the way in the West to speak of or identify a "B series of space". Our Western God is omnipresent. Japanese gods on the other hand have a "place dot," or many scared space that dot, anchor and objectify the space. On this basis it is Western, or at least Newtonian, space that is "indexical" (before me behind me) related to a inertial, three dimensional frame of reference. (1) Bachnik and Lebra's theories regarding the "indexical", relative nature of Japanese space perception, emphasising inside (uchi) and outside (soto), front (omote) and back (ura). (2) The destruction of scale in Japanese plants (bonsai), gardens (zen gravel gardens), and interiors (if my observations regarding the tricks used to destroy perspective are correct). How should a comparison of Japanese and Western space and time perceptions be approached? A) By considering the ways in which space and time perceptions inter-penetrate and dominate, arguing that the Japanese have a spatial view of time, and Westerners have a temporal view of space, perhaps. Japanese time perceptions don't have the year dot but they have a sort of C-series, or rather C-loop, in that the fleeting nature of cherry blossom is not seen as solely a purely Heracleatean flux but as something that will repeat. Perhaps it could be argued that this cyclical view of time results in a the creation of a "time-space." the seasons of the year. Do Westerners have a temporal view of space? Does the geometry and regularity of Western gardens and architecture reflect the tick tock of a clock? B) From the point of view of a conceptual abstraction capable of framing both time and space. E.g. by abstracting the "A series" and "B series" to apply to space as well as time? Or the use of words such as "flow" and "repetition," and "reference point" that may perhaps be applied to time and space? The geometric gardens and Neo-georgian cityscapes emphasise the "flow of space" as cherry blossom emphasise the flow of time? Geometric gardens and cherry blossom may also emphasise a repetition. And finally, perhaps in both geometrical gardens and cherry blossom there is an absence of a spatial or temporal reference point respectively. How? Do antiques present any sort of "trick" corresponding to the scale destroying 'trick' of gravel gardens, bonsai trees and Japanese interiors? Does "Neo-Classical" Georgian architecture of Bath present a similar sort of dillema: instead of an unanswerable "is this big or small", "is this old or new."? Does neoclassical architecture, or do shiny polished antiques forces their viewers to suspend judgements of time? Is there a British Zen!? I have never felt that Bath architecture was in any way Zen when I lived there but perhaps to a Japanese visitor it presents a similar "vortex" of conflicting, interpretation defying, agelessness. If so this would help me to understand Japanese architecture. Japanese architecture confuses me, creates in me a vortex of trickery, but I am sure that Japanese that are used to it have suspended judgement already. To them it is peaceful, as Bath architecture was to me. Perhaps when I lived in Bath I had already suspended judgement as to whether buildings are old or new. Bath architecture was old AND new, as bonsai trees and gravel gardens and big and small. If bonsai trees and Bath architecture are both a trick then, both should leave a pure experience of something. I can grasp, however fleetingly, the way in which Japanese architecture makes me "see the light," "the purity of experience" through "cessation" of interpretation. But what does Western architecture make anyone see (or hear?). Am I too anti-Western, anti-temporal. "Cessation" sounds profound, but is a very anti-temporal term. Perhaps "purity" is also linked with space. It is certainly linked with Shinto. When Husserl and Nishida engage in 'bracketing' they experience different things. Nishida stopped (with all the anti-temporality that that implies) interpreting and saw the place/space/mirror. Husserl on the other hand discovered (with an implied anti visio-spatialness) the transcendent the "irreel," "forms". I have always been dismissive of the latter, dismissed Plato's spelunking satori as mere myth. The forms are fantasy, mere words, I thought. Or again I may have been too keen on vision. When Nishida or Zeami experience their place or flower, they might be the first to admit that there is nothing to see. I need to change my title, which is now, "Japanese Space Unextended & Western Time That Does not Flow." Japanese space is still in some sense extended (how can space not be) but scale, big small, this in front of that distinctions are lacking. Western time, or at least the antiques, are old but here still, past but present. They both (Japanese space and Western time) lack something, and have something gained. Space-less Space and Timeless Time? I will go for that. Anyway, am I an old structuralist dog chasing something or just a waffler? Ryoutaro Shiba and Donald Keene point to similar differences but reach opposite conclusions in their discussion of the Japanese and Japanese Culture. They say that Europeans do not want to feel time (then why the obsession with antiques, even with rows of things evolving over time even), and are pleased if works are preserved completely as if it were made the day before. This is true, and great labour goes into preserving antiques I know as the son of a picture restorer. But at the same time, it is important that the antique is old. It is important to Europeans that an item looks both new and also it is important that it be old. In Japan however, very little importance appears to be given to preserving old things, or to age itself, with Ise Shrine and Japanese houses being rebuilt regularly. Donald Keene and Shiba also claim that Japanese prefer works that are broken a little or faded. 遼太郎司馬, & キーンドナルド. (1996). 日本人と日本文化 (改.). 中央公論社. Middle Right: "Prospect Park Place West Victorian brownstone interior dining room fireplace mantle by techpro12. Techpro12's blog has many similar images. Image* Hatsune Miku in Bangkok by Colodio (who retains copyright) isolated, only the right and side, rather badly by me. Cosplay refers to wearing a COStume to play or mimic a cartoon (anime) or comic (manga) character. It is particularly popular in Japan where there are large events held periodically where costumed people like the lady above, get together. Cosplayers can also be seen in the Harajuku area of Tokyo, and all over Asia, and now the world, since Cosplay has spread out from Japan. In Japan it is far from being a widespread phenomena. It is the sort of thing that like dancing, the Japanese would not want to do badly. Cosplayers will go to considerable lengths to get their clothes, hair, make up and poses just right. Cosplay is doubly visual. Firstly, cosplayers rarely speak but rather just pose, often for photographs. Their mimicry is a visual art. Secondly the object of their mimicry - the cartoon and comic characters - are particularly visual existences. I will argue that Japanese comics are more visual, hyper-visual when compared with Western cartoons and graphic novels in another post but here I want to suggest that cosplay is the predominantly visual mimicry of the predominantly visual. These Japanese cosplayers are strange eh? I can feel "conformist," tripping off readers' lips, because isn't copying always conformism? Yes, copying is always to an excent conformism but please see the last paragraph. And futher, the Japanese are not, Asians are not, particularly conformist. Does this lady look conformist to you? Doesn't she look weird? She may still look conformist because she is not speaking. Without speech it may seem as if she has less personality than an endless loop tape recorder (see previous post) but, that is because Westerners are logocentrist. Performing a Nacalian transformation, the Japanese Cosplayer in the imaginary is equivalent to the Western voice player, more commonly refered to as the impersonator*. Back when I lived in the UK I used to mimic vocally a purerly vocal existence: "Mr. Angry" of the "Steve Wright in the afternoon" radio show. I was the UK equivalent of a Japanese Cosplayer. I was as conformist, but probably not as good. I would not have done it had I thought my mimicry would not be recognised however. My voice (like the appearance of the Japanese) is not something that one plays with lightly. It seems to me that Western impersonators are Nacalianly transformed Cosplayers because they predominantly vocally mimic predominantly vocal existences. This is not to argue that Japanese cosplayers say nothing at all, or the Western impersonators do not change their appearance at all, but there is a strong difference in emphasis. The personality or self that is mimicked and does the mimicking is felt to reside in the face and appearance in Japan, and the words and voice in the West. Please have a look at some impersonators on Youtube. You will see that not only do they change their appearance very little, but also that they choose particularly characteristic voices to impersonate. For that reason, Christopher Walken, and Al Pachino are comon favourites. Cosplayers choose characters that are easily visually recognisable such as Hatsune Mikku above. While the days of radio - such as the Goon show - are gone, and all characters these days have visual and verbal aspects, the characters that are impersonated in the West are defined, as Westerners are defined, above all by our words and voice. Here are some Western cosplayers, Impersonators. Finally it should be noted that to a degree Westeners are all impersonations, and the Japanese are all cosplayers, because the self is nothibng more or less than self mimicry, there is not self, no individual other than in this attempt at duplication. The self is created through an attempt to visualise oneself, or narrativally impersonate oneself into existance. This post was inspired by a kind question from Mudakun. *There are also impersonators in Japan, just as their are fancy dress parties in the UK but I argue that Japanese impersonation (monomane) even or especially rakugo, is extremely visio-imaginary. Please see this introduction to rakugo in English. Fundamental Attribution Error, Nakajima, and Endless Loop Tapes, a photo by timtak on Flickr. Nakajima's great 'theory of Japan' (nihonron) regarding the 'loundness' of the public announcements in Japan is fundamentally the same as the Fundamental Attribution Error. Professor Nakajima is a recently retired professor of Kantian philosophy. He is, I believe, highly Westernised. He spent a considerable amount of time in Germany, presumably speaks German, and studies and presumably loves one of the most Western of philosophers: Kant. It takes leaving ones culture to know it. Normally ones own culture is so obviously-the-normal-way-of-doing-things that it is transparent. It is only those that have participated in other cultures that can see there own. Professor Nakajima was sufficiently deculturized to realise that public announcements of various sorts in Japan are strange. Japan is awash with public announcements in the form of recorded or electronically simulated voices that blare out messages such as vending machines or cash dispensers that greet their customers, buses that announce that they are reversing, election trucks that blare out linguistically meaningless recordings of a politician thanking people for their support, and endless loop tape recorders that blare out the special offers in retail outlets as pictured in this photo. 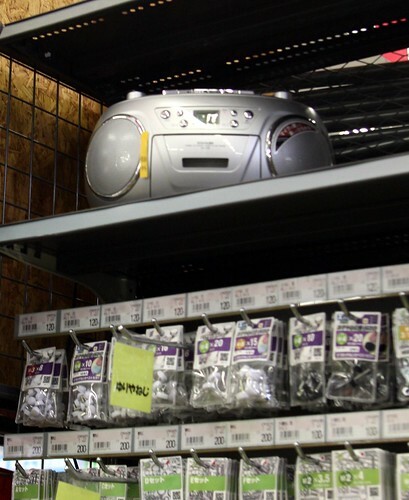 The endless loop tape recorder shown here stood at the entrance to a local electronics store endlessly shouting out the special offers on sale at the store. In the first few years of living in Japan I used to stop in front of these endless loop tape recorders and attempt to understand what they were saying. One of the reasons that I did so was because my Japanese language ability was insufficient. But even when I was able to understand the language of the tape, I still stopped, and listened while Japanese store goers walked on by, seemingly oblivious. I found the endless loop tape recorder arresting, more worthy of attention, and very strange. When I first arrived I arrived in Narita airport in Tokyo, I got on a horizontal escalator / conveyor belt walkway (what are they called?) and shortly before the walkway came to an end a voice came out at foot level warning me that the walkway would end. I picked up my feet as if I might step on the unseen announcer that must (I felt) be hiding underneath the moving hand rail. Shortly thereafter, when I first purchased a canned drink from a vending machine in Japan that spoke, I felt that there was a woman (in Japan it is generally a woman's voice) hiding inside the vending machine thanking me for my custom. I am now used to all the depersonalised voices that one hears in Japan. It no longer surprises me when buses 'say' "reversing, reversing, reversing." It no longer surprises me when bullet trains 'say' "Please don't bring dangerous things onto this train." Nakajima (brilliant though his observations are) explains this phenomenon -- the tendency for there to be disembodied voices in Japan and their strangeness -- using the same old same old collectivism vs individualism trope. He points out that private speech, such as by students in class, or by people using cell phones on trains (I am not sure if he used these examples) is repressed, not-allowed-in-Japan, and argues that speech is only allowed when it is a public, disembodied, announcement. Nakajima also complains (if this is the right word) of the loudness of these announcements which prevent private speech, or western style (Kim, 2002) "thought". It seems to me that my issue with these endless tape recorders, and other linguistic public announcements is rather directly associated with the Fundamental Attribution Error. The Fundamental Attribution Error refers to the tendency of people to assume that behaviours are the result of traits. According to this theory, we, humans, have an erroneous tendency to believe for instance that if a person is late to a meeting then that is because that person is not a punctual individual. Most of the research on the fundamental attribution error, however, concentrates on one behaviour: reading out loud from texts that are constrained. When Westerners listen to someone read out loud, then even if they know that the text that the person they are listening to is reading a text which that person has been forced to read, Westerners still believe that the person in question believes in the purport of the text. The text as read out loud is felt to be expressive of the mind, person, self, of the individual. Japanese people however are far less likely to feel that a reading out loud represents the true feelings of the person that is doing the reading. This difference is ascribed to the purported fact that Japanese are, and realise themselves to be, less individual, more collectivist, more context dependent. When a Japanese person hears someone reading a text then they do not assume that the text represents that person, merely that the person is (as is the case under constrained conditions) merely conforming to pressure, because social pressure is rife in Japan, and free self expression is not allowed in Japan. This, the conventional interpretation is hogwash (false). The Japanese are as free to express themselves as anyone else, or more so. But the medium or mode of their self expression is Nacalianly different. That the Japanese can create cityscapes, products, images, fashion in such zany abandon testifies to this fact. The reason that Westerners (and Westernised Japanese) find mechanically produced, or constrained speech to be representative of traits is because that we Westerners believe that we are speech, that thinking is speech, that the person is speech. The Western self is a narrative. The strangeness of these endless tapes that announce products, and other announcements produced by machines, are the same as the reading-out-loud used in Fundamental (!) Attribution Error research, and their potency can be explained in the same way. Westerners believe that they are themselves narrations, speeches. Speech is thought. Speech is felt to be accompanied by (chimerical) ideas. Speech is felt to be the product of, the essence of a person. And so, Westerner that I am, when I heard those mechanical/recorded/computerised voices in Japan, I presumed them to be, or desired them to be, from a person. Japanese public announcements expose the lie of my being: speech does not imply an existence, nor is it necessarily accompanied by an existence. Speech is just speech. There are no "ideas." Speech is noise. With regard to speech (but not to self-representational images) Japanese people realise this. Does this Lady Like Blue? Hypothesis regarding the Fundamental Attribution Error in Japan, a photo by timtak on Flickr. This lady is a model. I told her how to pose. Half the models I employed were wearing clothes that they like, and the other half are wearing clothes that I gave them to wear. [Free Condition] Lets say that the lady chose the blue top herself. Does she like the blue top she is wearing? [Constrained Condition] Lets say that I told her to wear one of the tops that I had brought along. I passed her a blue top. Now, does this lady like the blue top that she is wearing? My prediction is that more Japanese will answer that the lady likes blue, even under the second, "constrained" condition. The fundamental attribution error refers to the tendency to infer traits from people's behaviour. If one sees someone behave violently, then there is a tendency to believe that person is violent, when in fact they may have been acting out of self defence. However most of the research (that I have read anyway) on the fundamental attribution error has focused on a single behaviour: reading out loud. In the USA it is found that even if subjects know that the reader has been constrained, and forced to read a certain essay, they still judge that the reader believes that which they are reading lout loud. The Fundamental Attribution Error disappears under the constrained condition in Japan. This is because, we are told, the Japanese are contextual, interdependent, and behave in accordance with the social rules and cues pertaining in the situation, rather than according to their traits. Japanese people are thus accustomed separate their "honne" (true feelings) and tatemae (social front). When they hear that someone has been constrained therefore, they do not fall foul of this "fundamental error," and just presume that the reader is reading what he has been told to read. In accordance with the overall Nacalian theory presented by this blog, I predict that the above result may be an effect of the Western belief in the narrative self, the Western belief that speech is thought, the Western tendency to see the person in language. In other words, Westerners will be far more likely to make Fundamental Attribution Errors about speech acts. Visual self representation, such as clothing, and architecture is seen has being mere "context". In Japan however, it may be the case that visual self-presentation is seen as being the self, the person. Thus if someone is wearing blue, then even if Japanese people are told that the person has been constrained, they will still have a tendency to believe that the wearer likes blue. I will test this. By the way, the lady in the above picture brought the blue top along. I presume therefore that she likes blue, but I don't know. Image used in education with permission. The above was based on a seminar presentation of previous research by Ms. Fujimura (Thank you!) based on the following excellent textbook of cross cultural psychology. 増田貴彦, & 山岸俊男. (2010). 文化心理学〈上〉心がつくる文化、文化がつくる心. 培風館. Surnatural Tree Pruning a video by timtak on Flickr. According to my observation of how our Japanese gardener pruned our trees (such as in this photo), it seem to me that he usually pruned the main branch leaving the sub-branch to grow, reducing symmetry and straightness, and producing a 'more natural than natural' sur-natural effect. It is interesting that conversely in high European gardening and art that uses nature there is instead a reverse attempt to impose straightness (and other geometrical form) and symmetry to nature. Thus on the one hand one often hears in Japan that Westerners like to dominate nature, whereas Japanese prefer to reach a symbiosis with it, or even that they appreciate nature as it is. Japanese gardeners do not leave nature as it is, but rather instead control the nature of the garden to an idealised form (not unlike the Western idealised form, and no less controlled) of what they view nature to be. One attempts to impose conceptions and regularity on nature, the other attempts to remove those aspects of nature that appear to be conceptual or regular. The above animation used an original photo "isolated branches," with kind permission by ecormany.